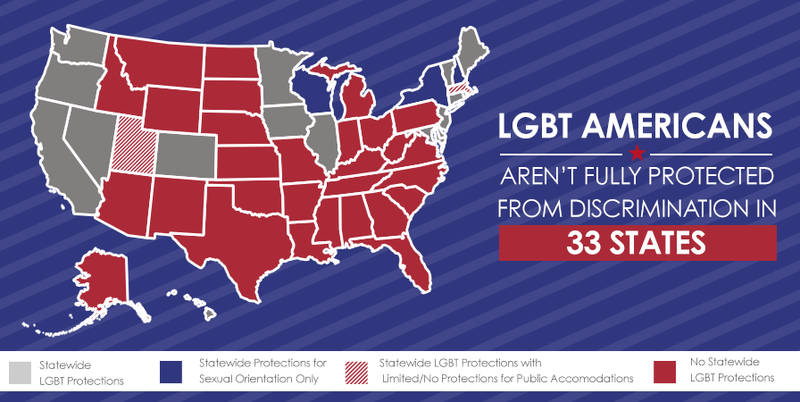 In 33 states, there still aren’t comprehensive laws ensuring that LGBT people can’t be fired, denied housing, or turned away from a public place simply for being who they are. As state legislatures begin reconvening, many of them will consider updating their existing nondiscrimination laws – which often already exist to protect constituents across categories such as disability and race – to include protections that extend to LGBT people. 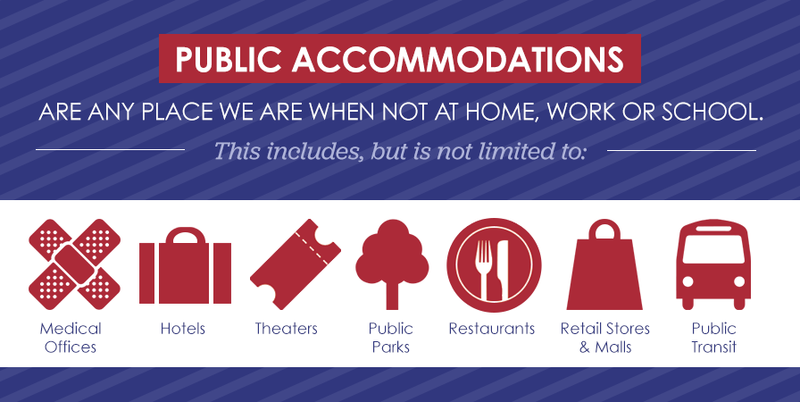 Public accommodation provisions in these laws are essential, but they’re also the portions most frequently seized upon by those opposed to extending protections to LGBT people. From Kalamazoo, Michigan to Anchorage, Alaska, opponents scare and intentionally mislead constituents and lawmakers by thinly veiling their concerns as issues of privacy and safety. The most recent example is in Houston, where anti-LGBT campaigners referred to the city’s equal rights ordinance — which protected Houstonians in places of public accommodation not only on the basis of sexual orientation and gender identity, but across 15 different categories, including race, gender, age and veteran status — exclusively as a “bathroom bill” and garnered media that bought into their inaccurate framing of the HERO ordinance without correcting the opposition’s misclassification. The reality is that nondiscrimination laws don’t change the fact that it’s already illegal to assault someone in a restroom or anywhere else. 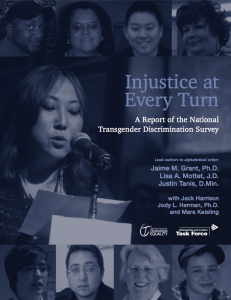 Across the nation, 17 states, Washington D.C., and more than 200 cities and towns have already passed transgender-inclusive nondiscrimination laws that protect Americans from discrimination in public accommodations. There has been no uptick in public safety incidents in these cities and states. And there has not been a single documented instance in which a person committing sexual assault or harassment in a restroom was transgender or pretending to be transgender. In fact, transgender people are more likely to be targets of violence and assault in public restrooms and in other public spaces. A report by the National Center for Transgender Equality showed that 53 percent of respondents reported being verbally harassed in a place of public accommodation. Transgender Americans, like all Americans, value privacy and security. Comprehensive nondiscrimination laws are about more than just restrooms. Dismissing them as a “bathroom bill” is misleading and ignores the important protections they provide in other areas of life. Nondiscrimination laws that include public accommodations make communities and businesses safer and more welcoming for all people. Finally, fully including transgender people in all spaces, including restrooms and facilities, is at the heart of protecting anyone from discrimination on the basis of gender identity. If a law excludes men and women who are transgender from men’s and women’s spaces, that law subsequently treats transgender people as less than fully human. Denying a transgender person the ability to use the proper restroom is a rejection of their basic dignity and identity. If a law excludes men and women who are transgender from men’s and women’s spaces, that law subsequently treats transgender people as less than fully human. Starting this month, Freedom for All Americans is gearing up our legislative work in a number of priority states, including Indiana, Arizona, Georgia, Florida, Pennsylvania, and Massachusetts (where FFAA’s chief program officer, Kasey Suffredini, has served as a full-time chair, and in which a bill is pending that specifically addresses protections for transgender people in public accommodations). Nondiscrimination laws with explicit protections for LGBT people in public accommodations will make their lives better. Freedom for All Americans will continue amplifying the true profiles of LGBT people whose lives will be affected in a real way, and providing the crucial resources for journalists to tell the whole story.